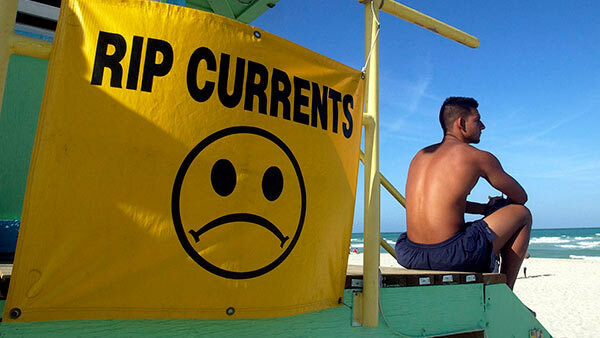 About 100 people each year in the U.S. drown because of rip currents, and about 80 percent of swimmers who must be rescued in the ocean are caught in them, according to the United States Lifesaving Association, a nonprofit lifeguard group. A rip current is a channel of water that flows out into the ocean from shore. The motion and waves of the ocean are constantly changing the sand on the bottom. Water going back out to sea takes the shortest path and sometimes all that water flows into a narrow area, like a depression between two sand bars, creating a rip current that can pull swimmers away from shore. Rip currents can by anywhere from about the length of a car to over half a football field, said Monty Reed, lifeguard coordinator for North Myrtle Beach, South Carolina. IS IT THE SAME AS AN UNDERTOW? It is not an undertow. A rip current will pull swimmers out to sea, but won't pull them under, Reed said. The currents are temporary and follow the dips and rises of the ocean floor instead of a constant flow. That's why the term "rip tide" is a misnomer, because tides are caused by the gravitational pull of the moon. WHAT IF YOU GET CAUGHT BY A RIP CURRENT? If you have a boogie board or other flotation device, hold on, Reed said. The current won't pull you under. "People drown from fear and panic. They don't know what to do. They will dump their boogie boards and go under," Reed said. Instead, ride it out. The water will eventually stop pulling out. Or, swim parallel to shore to get out of the rip current. But don't swim against it. Some rip currents flow at 8 feet per second, which is faster than Olympic swimmers. IS IT SAFE TO SWIM ONCE TROPICAL WEATHER PASSES? The churning waves from tropical weather will create new sandbars and depressions, causing rip currents to pop up suddenly, Reed said. During these times, lifeguards brace for busy days, especially when there's nice weather. Reed said it is always best to swim near a lifeguard stand. Also, talk to lifeguards, who can tell you how bad conditions are before you get in the water. And listen to their advice. During conditions where rip currents are likely, Reed tells swimmers not to get in above their knees or waist. "Stay close to shore, where you can manage yourself in the waves, and that will keep everyone safe," Reed said.